A personalised magnetic christmas countdown metal board. Complete with whiteboard pen. A personalised magnetic elf report card metal board. Complete with whiteboard pen. A magnetic elf report card metal board. Complete with whiteboard pen. 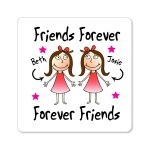 This magnet is personalised with a Friends Forever design. It is available with a choice of designs depending on hair colour. 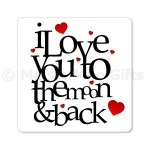 This magnet features an exclusive design reading I Love You To The Moon & Back. 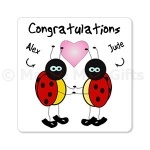 This magnet is personalised with a cute Congratulations ladybird design. This magnet is personalised with a cute Happy Anniversary ladybird design. This magnet is personalised with a cute Happy Birthday ladybird design. 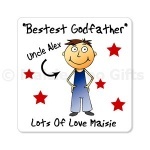 This magnet is personalised with a cute Happy Valentines Day ladybird design. 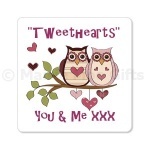 This magnet features an exclusive design from our Tweethearts Owl range. A fridge magnet made from brushed steel metal with a funny slogan. Gift Boxed. A fridge magnet made from metal with a sentimental saying. Gift Boxed. Personalised Aprons, Personalised Door Plaques, Personalised Coasters, Personalised Mugs, Personalised Gifts, Personalised Fridge Magnets, Personalised Greeting Cards, Personalised Keyrings, Personalised Travel Mugs, Personalised Window Signs & Personalised Mobile Phone Cases and Personalised Bibs.